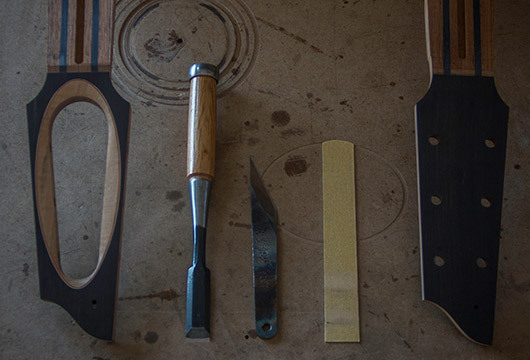 Our bespoke process is carefully considered to give you the opportunity to enter into what we hope will be an exciting and inspiring journey with us, culminating in the arrival of your new dream guitar. From the outset we want to give you an instrument that fits you perfectly. Customised for your unique requirements, leaving no obstacle between you and the music. An instrument that will be an heirloom enjoyed by generations to come. One that will be as beautiful to look at as it is to play. 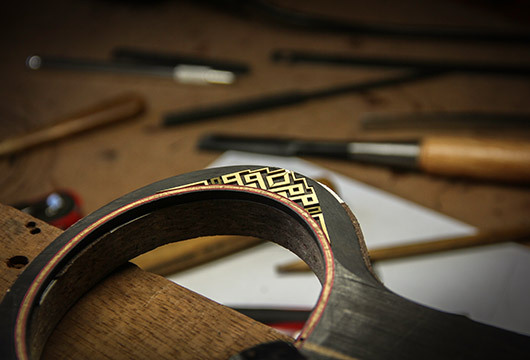 To this end, there are three main directions in which a Casimi guitar can be tailored. 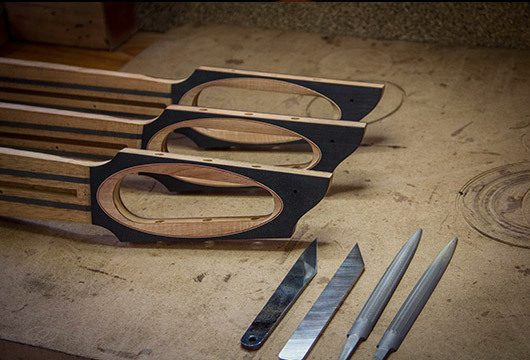 One is the choice of woods, two is the addition of any or all of our signature features, three is the addition of custom inlays in a variety of materials. 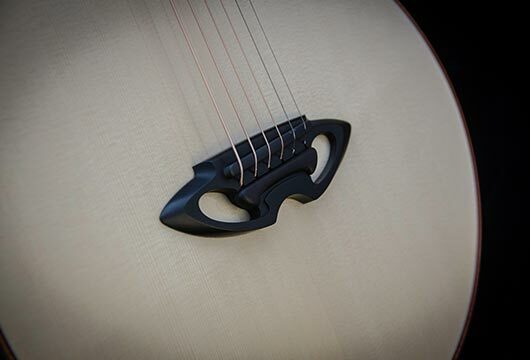 The Casimi Signature features give our guitars a completely unique aesthetic and set them apart from almost all other contemporary instruments. 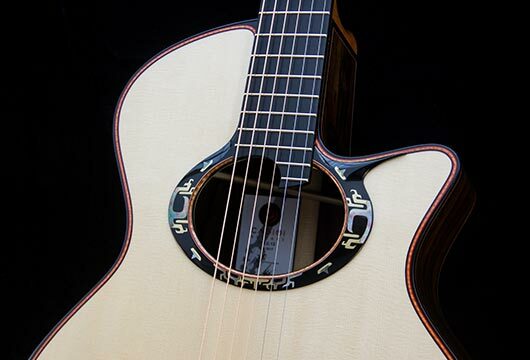 Any of our guitars can be upgraded with any or all of our signature features. Were the full set of signature features is added, the guitar will acquire an “S” in its model number. Hence a fully up-graded C2 becomes a C2S. The headstock of a guitar is rather like the head and face of a person. It is that part which is instant-ly recognisable and sets them apart as an individual. 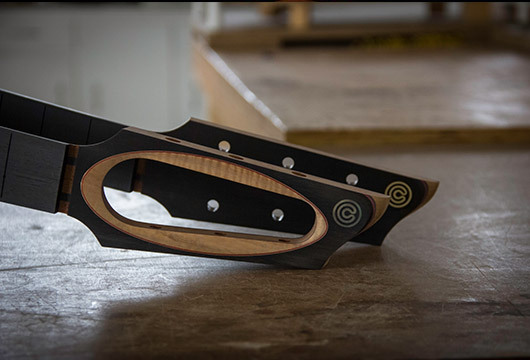 The Casimi signature hollow headstock is a bold visual statement and represents our design philosophy of less is more quite literally. 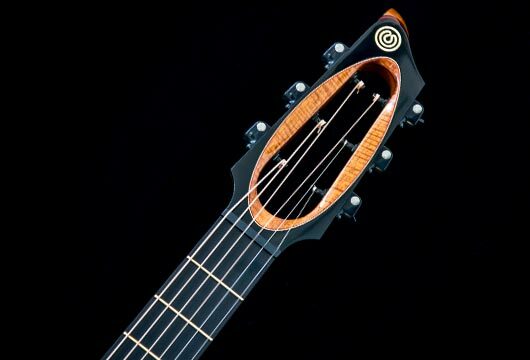 Typically hand carved from solid ebony or African Blackwood, the rosette unites the the finger-board, the body and the sound hole in an holistic synthesis. Blending the lines between these parts to form a continuous flow of form. Its also the perfect canvass for custom inlays. 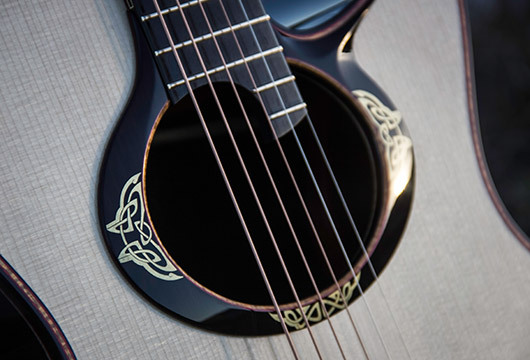 If you wish, the rosette can be embellished with inlay art specific to you. Otherwise, we take our cue from the place of origin of the wood itself. 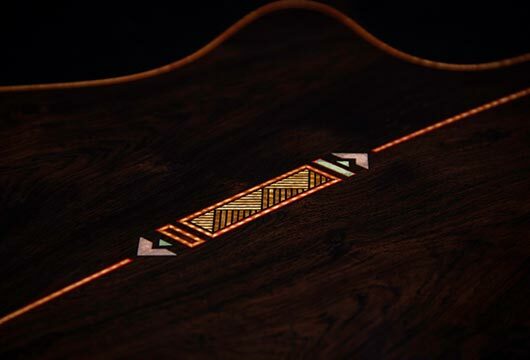 A Cocobolo guitar may have Mayan or Aztec inspired motifs, a Koa guitar, Hawaiian, and an African Blackwood guitar, something from sub-Saharan Africa. So its a way to pay our respects to the trees and where they came from. 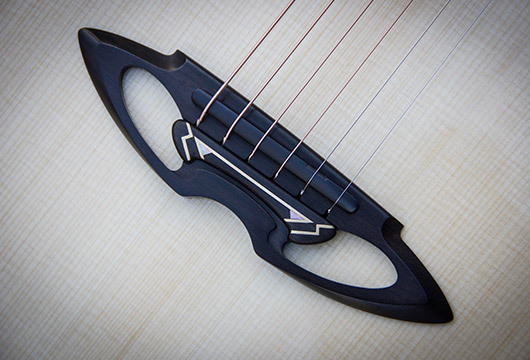 This highly unique feature is a more elaborate take on our proprietary magnetic bridge. Doing away with bridge pins, we have replaced them with a single magnetic cap. 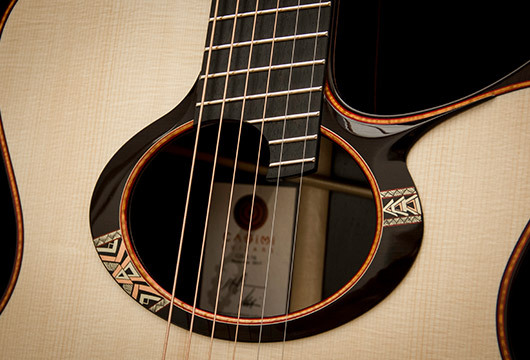 The Casimi signature bridge features a hand carved sculpted surface with two large openings, or hollow ports. These are at once eye catching and facilitate easy access for the fingers to remove and replace the magnetic cap. It encapsulates our aesthetic philosophy by removing that which is non essential without loosing strength or visual balance. Our custom sound ports have been a wonderful development that have evolved quite organically. It all started some years ago with a dear friend and client who had the idea to commission a special sound port from us in brass open work. 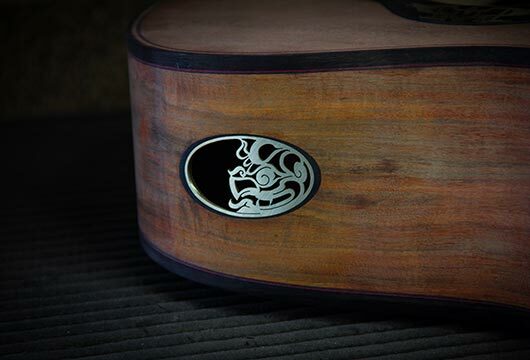 The project worked so successfully that we have had more clients approaching us for their own custom sound ports and now its become something we are ex-cited to offer as an additional way to customise and upgrade your guitar. There are few things quite as magical as the iridescent shimmer of mother of pearl. 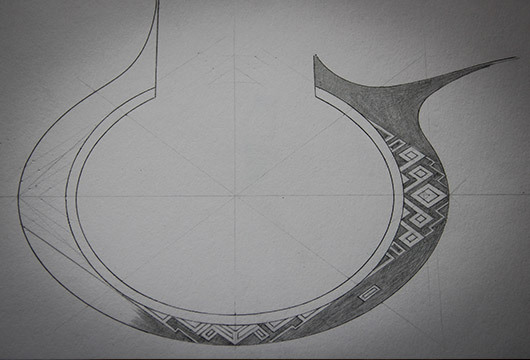 This is the most typical choice of material for inlay art, however it is not the only one. 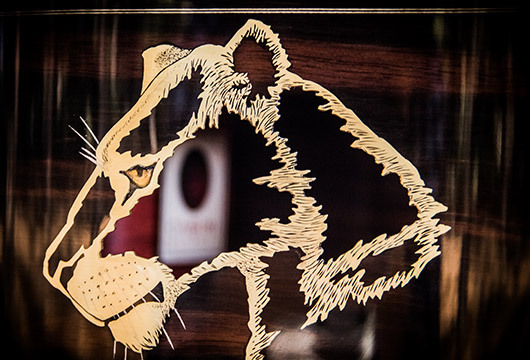 We also work with a range of metals such as brass, copper, silver, aluminium and bronze as well as exotic and stained woods, shells, amber and bone. In fact, our pallet is constantly expanding to include new materials as we reach for new colours and textures. 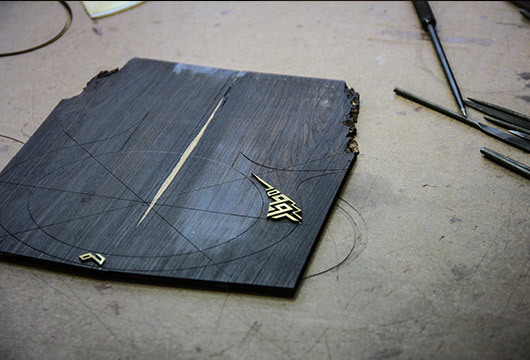 designing an inlay project is a special process requiring much thought and time. Its a little like dig-ging for gold, in the old wild west. Searching for clues that will lead to us to a seem of inspiration. But like gold, the reward is worth waiting for. Its one of the best ways to make your guitar truly personal and completely your own. An absolutely bespoke instrument.